Moving into a new home is one of the most exciting and happy times in life… it is also one of the busiest times in life. 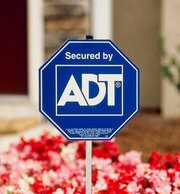 Getting your home protected is often just one of the items on a long list of all the things you need to accomplish. So you need simple solutions! If your new home came with a security system or pre-wire, it is almost always best to have a security expert take at look at your options. You may be able to save significant money by using some of the security products already installed and have us upgrade your existing system to modern day technologies. If you bought a property and are going to custom build your home or do a major remodel, have us come out to go over options for wiring your home for a security system before the sheetrock goes up. "bought a new house and needed an alarm installed ASAP." "We had a great experience! We bought a new house and needed an alarm installed ASAP. They were able to switch our initial appointment to a day earlier (since we closed on the house a day early) and were able to install the alarm the next day! Brandon went over all options and was not pushy. He was knowledgeable and honest. William came to install and was efficient, knowledgeable and super nice. We truly appreciate the service and look forward to a safe life in our new home!" Are Wireless Security Systems Superior to Hardwired Alarm Systems?